Tech’s baseball season began last Friday with a 17-3 win over the St. John’s Red Storm, followed by a doubleheader split on Saturday against the Fordham Rams at Russ Chandler Stadium. The team then traveled to Statesboro on Tuesday and beat Georgia Southern, 7-4. The 17 runs scored by the Jackets on Friday were the most the team has recorded in a game since 2010, and the most runs in a home opener since 1951. Freshman outfielder Kel Johnson was the star of this game, the first of his collegiate career. He batted 4-for-5 with a home run and three runs batted in. “It felt great. I had been waiting to just get out there and get this White and Gold on,” Johnson said. “It was an honor just to be in the lineup on Opening Day. The game began with a few defensive lapses by the Jackets, putting St. John’s on the scoreboard in the top of the first. The chilly 40 degree weather combined with shaking off the rust of the offseason may have played a role. The Jackets were quick to bounce back in the bottom of the inning, scoring six times to take a 6-1 lead. An infield single by Johnson loaded the bases to begin the attack, and a few batters later Brandon Gold blasted a three-run homer, the first of his career, to give Tech a comfortable lead. Johnson drove in his first run off of a ground rule double in the second inning, and his three run homer came later in the seventh. Another freshman, Blake Jackson, also recorded his first career home run on Friday, during his first at bat while pinch-hitting in the eighth. After not having a three home run game at all last year, the Jackets did it on Opening Day in 2015. Starting pitcher Jonathan King returned to the mound after missing most of last year due to a shoulder injury, pitching five innings and giving up two earned runs off of three hits. Ben Schniederjans and Patrick Wiseman combined to pitch four scoreless innings of relief. “Certainly it was a good first inning offensively for us and I felt that King and Schniederjans threw the ball well,” head coach Danny Hall said. “We had a lot of different guys get hits so it was definitely a good way to start the season. In the first game against Fordham, what began as a pitchers battle exploded into an offensive showdown mid-game. The Rams began the scoring with three runs off of a bases clearing double in the top of the fifth, and added another run in the sixth. The Jackets came storming back to tie the game at 4-4 in the bottom of the sixth, highlighted with a triple by Gold. However, the Rams plated four more runs in the next inning and won the game 9-4. Ram shortstop Luke Stampfl drove in five of his team’s nine runs. The second game of the double header started poorly for the Jackets, as Fordham jumped out to an immediate 3-0 lead in the top of the first. The team responded, slowly chipping away one run at a time while starting pitcher Ben Parr settled down, not allowing a run over the next three innings. 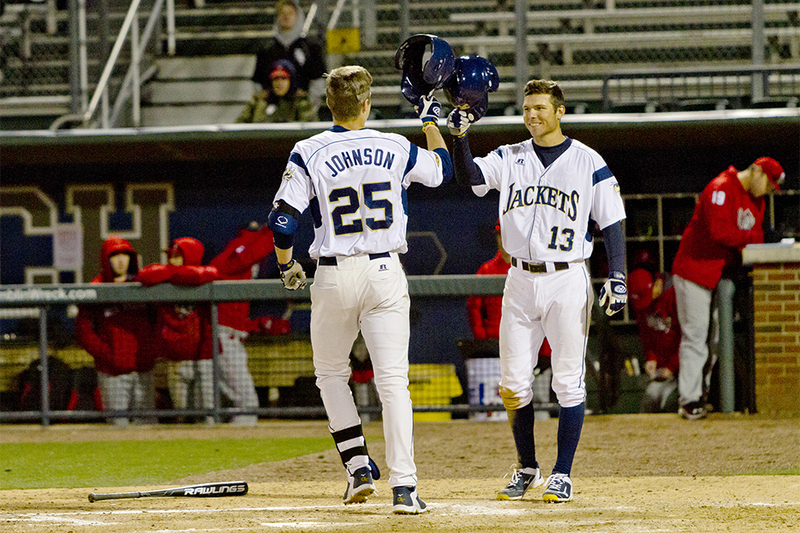 The Jackets took the lead for good as part of a four run fifth inning, which began with a solo home run by Johnson. Keenan Innis also drove in a run that inning on his way to a 3-for-3 finish with three runs scored. Gold and Zach Ryan each pitched two innings of solid relief to seal the victory. Rookies Johnson and Bailey delivered again on Tuesday against Georgia Southern, as they drove in all seven of Tech’s runs in a 7-4 comeback victory. Trailing 4-1 in the top of the seventh, Johnson blasted a grand slam over the left field fence to give the Jackets a one-run lead. Bailey added two more insurance runs in the following inning with a double down the left field line; his third hit in as many attempts. The Jackets are back in action this weekend in Conway, South Carolina, where they will face Florida International, Albany, and Coastal Carolina. They will follow that series with two midweek games: a Tuesday showdown at Auburn and a home tilt against Georgia Southern on Wednesday.